Another season is now behind us and the playoffs begin this afternoon at 1330 EST in Tampa Bay. How did I do in my projections? Who do I predict for the World Series? Let’s check it out! Way off on Baltimore, perfect with Boston, and I got the top two mixed up. After a (glorious) season where the Yankees didn’t make it to the playoffs for once, the Bronx Bombers came back with a vengeance and took it all. The Yanks may have lost Damon and Matsui, but they’re still in a strong position in the AL East and look poised to make the playoffs in the division. Players are getting older on that team and the pitching isn’t as strong as they’d like, but, barring some kind of major injury, I stand by that prediction. The Red Sox also made a few big moves, getting rid of Jason Bay and adding in Adrián Beltré, and they’re projected to have a solid season with strong defense and slightly weakened bat strength. I think a lot of how well they do this year depends on whether or not they’re able to produce runs at the plate with David Ortiz, who did not perform to standards last year. My favorite in the East, the Tampa Bay Rays, have had a super strong spring. With the best spring record of the AL, they could upset the Yankees or Red Sox if and only if their rotation and bullpen return to 2008 form. The offense is there, the defense on the field is there, it’s just a matter of making outs. Will Rafael Soriano be enough to solve their closer woes? That alone will tell you what this team will do this year. I’m excited to see what the Orioles put together this year. Their investment in youth is starting to bear fruit as prospects make their way onto the field, but this young, inexperienced team is up against juggernauts in the Yankees, Red Sox, and Rays. I’m going to call this a building year for the Orioles, even if that’s selling them a bit short. They would have a good chance in any other division, but not the East. There are few teams in baseball that bore me more than the Blue Jays (:cough: Royals, Pirates, and Padres :cough:). This is a team that acknowledged that they have no chance to make a run of it by trading Roy Halladay to the Phillies. When I try and underestimate my team for the sake of avoiding bias all I end up doing is getting their position in the standings wrong. As predicted, the ascent of Rafael Soriano was a real blessing to the team, allowing the bullpen to focus on being awesome and the rotation on turning in a fine season. David Price was Cy Young caliber all season, Matt Garza threw a no-hitter, and the rookies Wade Davis and Jeff Niemann made a solid statement in the rotation. Add in Jeremy “Hellboy” Hellickson to the bullpen and Tampa had great numbers off the mound. On the field, defense and small ball continued to be key. Carlos Peña had a rough season at the plate, but the rest of the team was able to pick him up. Jettisoning Pat Burrell was also a fantastic idea. Longoria continued to be amazing. Seems I was right on the perennial favorite Yankees. Their squad got it done all year long behind a Cy Young caliber season by C.C. Sabathia. Unfortunately for the Yanks, it seems I was also right about their aging lineup. Pettitte started ten fewer games than the rest of the rotation due to injury and his ability to pitch in this postseason remains a question mark. The rest of the rotation has been pretty shaky too with Javier Vasquez putting in a poor performance and AJ Burnett getting progressively worse, but Phil Hughes looks okay while the rookie Ivan Nova was pretty good in the opening innings. Jeter and Posada have started to show their age, but, overall, this is a top tier team that has feasted on its opponents all year long. I was way off about David Ortiz, who put in a solid season, but there’s no way I could have predicted the injury-fest that was the 2010 season for Boston. They were remarkably able to stay somewhat competitive to the end, but they just couldn’t overcome Tampa or New York. Maybe Toronto would have put together a third place finish had they kept Halladay, but his loss did not prevent the Jays from looking mighty dangerous in the East. Their 85 wins would be hyper-competitive in plenty of other divisions and the ascent of Jose Bautista as the only 50 HR hitter this season was remarkable. The funny thing about the Orioles is that they’ve played their best baseball when it mattered least. Replacing their manager with Buck Showalter seems to have done the trick, but it remains to be seen if they can win in situations where they play meaningful games. Whoa, I was scarily on the money with this one. For a while there, this division was the Twins’ to lose. Then the second best closer in the game, Joe Nathan, went down for the season, muddying up the waters. Add in that the team is moving to a brand new ballpark and things could get interesting. Gone are the super-competitive advantages of the Metrodome, replaced by what will be a SUPER frigid open-air ballpark that will take some getting used to. When it comes to Joe Mauer, I’m reminded of the fictional words of Michael Bluth, “You gotta lock that down.” Lucky for the Twins, they managed to get that done with an eight-year, 184 M$ contract. It should help. I hear a lot about Chicago’s rotation being so vastly improved, but it’s almost always followed by the caveat that Peavy needs to pitch well. It’s been a long while since his 2007 Cy Young campaign and he hasn’t been able to remain healthy. Despite how much Obama loves this team, I can’t stand A. J. Pierzynski and, by extension, the team. Detroit has a team that I want to love. Those poor guys live in a third world city that is on the verge of absolute collapse. They keep giving Dontrelle Willis chances to succeed (and he might be in the rotation this year), but I’m not sure that they will be able to keep up with the Twins this year thanks to weak pitching. I’ll be keeping an eye on these guys. The Indians may be on the upswing and ready to bounce back, but I’m not ready to believe that yet. I don’t see much happening for this team. Kansas City has an awful team aside from Zack Greinke. Well, Minnesota went and won this division, like I thought. They didn’t have to worry too much about closers and they picked up Matt Capps just to make sure that they’d be fine in the stretch. Target Field seems solid and the team just played well. Chicago had a chance to make this division closer, but they just couldn’t lock it down. Jake Peavy barely pitched and the team was just middling almost all season long. They’ll be remembered best this year for Mark Buehrle’s amazing play to first in the first game of the season. Detroit was so close to doing something with the division! Miguel Cabrera was playing MVP-caliber baseball, but the rest of the team just wasn’t on board. Sidenote: Willis was traded to Arizona. Cleveland still doesn’t have it. I’m skeptical that they’ll have it next year either. Kansas City has an awful team aside from Zack Greinke (and even he was mediocre). Despite their stupid long name, the Los Angeles Angels of Anaheim have had one of the most consistent teams of the century. They contend every year and make it to the playoffs almost every year. It’s hard to ignore how solid this team is. Unfortunately, they’ve been fighting a war of attrition these past two years with Texas and Seattle getting closer and closer to robbing AL West dominance away from them. They gained Matsui, but lost vital starter Lackey. Will it be enough? Seattle wants it this year. They went and signed Cliff Lee and even took the risk of signing the volatile Milton Bradley to bolster their bats. Things were looking great for Seattle until Cliff Lee ended up on the DL and Milton Bradley got himself ejected from two straight spring training games. Will they be able to keep it all together and make a real run for the West? The Rangers are solid, but they have a lot of reliance on players like Josh Hamilton who are very injury prone. They’ve been just short of the playoffs for several years now and they’re real hungry for it. I have so much apathy for the Athletics. I’m sure their team is pretty good and has a chance this year, but it never seems to pan out for Oakland. Texas is looking the best they have in a long time. Josh Hamilton is looking like the favorite for MVP and the boys from Arlington have a phenom on their hands with Neftali Feliz. Will they finally make it to the World Series? Where did Oakland come from this year? Maybe it’s the east coast bias, but I had no idea these guys were doing better than the other two teams in the division. Maybe the dynasty is reemerging. Los Angeles Angels of Anaheim. What did you do this year? At least you made the Rays look brilliant thanks to Scott Kazmir sucking it up all year long. Seatlle. I drank your kool-aid. All I got in return was the most anemic offense since the introduction of the Designated Hitter. Your season was historically bad. At least Ichiro continues to dominate and I got to see Griffey before he retired. If I hadn’t let bias toward the Marlins blind me I would have had another perfect pick. My favorite division also contains two of my least favorite teams in baseball, both of which are set to have great seasons. Last year’s NL Champions, the Philadelphia Phillies, are still just as good with Roy Halladay instead of Cliff Lee. They’ve still got a great lineup with good pitching and, even without their closer, they should still have a solid season. They are The Team To Beat (TM) in the East. Atlanta, my least favorite team, has got stars in their eyes for Jason Heyward, a top-prospect who made the team this spring. Heyward’s bat, combined with Hanson and Kawakami’s arms, could be very formidable in the East. This is a team that worries me. The Mets have had such terrible luck recently that it’s almost bound to start swinging back in the other direction…right? With an adjusted outfield to help home runs, their offense might perform a little better, but that injury-riddled team is not looking all that much better this year. If they outperform the Marlins, I’ll be surprised. Speaking of teams that won’t outperform the Marlins, Washington is almost guaranteed to make marginal improvements this year. Their rotation is still a mess, but veterans like Chien-Ming Wang and Liván Hernández can combine with the brilliance of Stephen Strasburg and the promising performance of Drew Storen and produce what might actually be a major league rotation. The lineup needs some work to score runs, but pitching is infinitely more important for a team that wants to win. Speaking of a team that emphasizes pitching, we’ve finally arrived at my favorite team, the Florida Marlins. Over the off-season they finalized a strong contract for Josh Johnson and kept Dan Uggla, keeping the rotation and lineups strong. Combined with Hanley Ramirez and Chris Coghlan destroying NL pitching and Ricky Nolasco’s brilliant performance on the mound, this is a solid team with only a few holes that need filling. If Cameron Maybin and Gaby Sanchez live up to their potential, I don’t see much standing in this team’s way. There’s always a question of pitching with the back end of the rotation, but Chris Volstad has been looking good of late and Anibal Sanchez fluctuates, but trends on the better side most times. The real question is in the bullpen where the Fish will be relying on Leo Núñez to close games. I’m not confident in Núñez yet. Atlanta barely scraped by to take the NL Wild Card. They came this close to making me happy and not making it to the playoffs. Despite losing Chipper Jones, they were able to hold on to their spot in the final eight thanks to fantastic performances by Jason Heyward and Tim Hudson. Bobby Cox should be proud of this team in his final year. Sidenote: Kenshin Kawakami was terrible this year. I really thought that Florida could be a second place team this year. JJ pitched fantastically for most of the season as did Nolasco and Sanchez, but they just couldn’t hold it together long enough for the bullpen to not screw it up. That’s where the most offseason work should be focused, IMHO. Nuñez did his best as the closer, but they might need someone new next season. Losing Cogz to a season-ending knee injury on a shaving cream pie was also super ridiculous. Everyone’s favorite Metropolitans continued to be the worst run team in the league. Thankfully for all of us, ownership has fired the GM and manager so hopefully the team can go in a new direction next year, assuming its contracts don’t weigh it down too much to make many changes. The Nats were looking primed to be reasonably competitive this year from the getgo. Their record was solid, Strasburg was coming up, things were optimistic. Then the bottom fell out. Starting pitching failed completely before June, Strasburg got injured in August (sidelining him until 2012), and everyone’s hopes and dreams died. The simple fact is that the Nats have no starting pitching. You can’t run a team without starting pitching. The Central has a chance to be interesting this year with strong squads being fielded by St. Louis, Cincinnati, and “this is our last chance for a while” Chicago. St. Louis has the best chance here thanks to strong pitchers Carpenter and Wainwright and their strong offense in Pujols and Holliday. Cincinnati has been a dark horse so many years in a row now that they’d better start performing. The promise of Aroldis Chapman could push them ahead if the offense follows, but otherwise the team has a strong uphill climb. 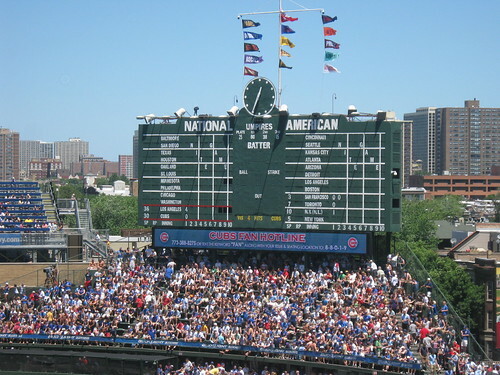 The Cubbies don’t have much time left before they have to start “rebuilding”. If they don’t put together a playoff season this year, it might be a while before we see one happen again. I still love Fukudome, even if the Cubs don’t. He’s a consistent and solid player. I don’t know much about Milwaukee’s squad this year, but they’re usually a solid team, but I didn’t hear much in the offseason that would convince me they were ready to push ahead of last year’s performance. The rest of the Central, the Pirates and the Astros, really don’t make an impact in baseball nowadays. Pittsburgh is really a AAAA team and Houston has failed to make any kind of splash in a long while. Cincinnati was the surprise here for me as they put together their best performance in something like 15 years or so. Votto might be NL MVP. Their success can be mostly attributed to Votto and the late-season call-up Aroldis Chapman’s stellar stuff in the home stretch. They get to face Philadelphia right off the bat and if they can’t hit Halladay and Oswalt right away, they could have problems. St. Louis just gave this division away. It was theirs to win at one point in August, but they just squandered their lead proving that Pujols, Carpenter, and Wainwright a complete team does not make. Will they fire La Russa now? What’s there to say about Milwaukee? Just not enough there at all to win. Maybe next year guys. Braun can’t carry a whole team. Houston and Pittsburgh. You guys are terrible. The ‘Stros picked it up later in the season, but it was far too late for that to matter. Arizona was so forgettable to me that I left them off of the list completely. The Rockies looked like they might make a run, but it fell apart and I was way off on LA and San Diego. Colorado made the biggest turnaround I’ve seen since the last time they did it in 2007 to win the wild card last year and make the playoffs. After that strong finish and with LA’s messy divorce keeping them from making significant progress on their team, I see Colorado as the frontrunners in this division. A messy divorce has been draining Dodger ownership of cash and the ability to run their team. At best, the Dodgers remain as good as they were last year. Realistically, they fall behind the Rockies and maybe even the Giants too. Solid pitching, but not much offense. It’s been the same story for years now. A strong team only because it keeps the run count down on the opposing team. San Francisco is my favorite team in the playoffs right now. Solid starting pitching (Lincecum, Cain, Sanchez) make for a potent postseason combo as well as great anchors for the 5-man rotation. Somehow this team managed to score runs despite Pablo Sandoval’s season-wide slump. I guess that the solid pitching was enough to hold off the West competition. The Friars (Padres) had a real chance of turning this into the NL West Wild Card, but they squandered it in the last few weeks and couldn’t complete. If this team can be this good next year they’re bound to win the West. Colorado really fell off from last season. For a while in September Tulowitzki made it look like the Rockies would repeat their ridiculous last minute run for the third year in a row making me look like a genius. Ah well…maybe next year. The McCourt divorce really sapped this team a lot more than I thought it would. Manny didn’t hit and the pitching wasn’t there. Torre will probably leave this year and I predict this team will not perform much better next year. Oh god the Diamondbacks are awful. They need a lot of work. Strasburg pitched again and it wasn’t quite as magical, but part of that was due to a bad mound. He still has a sub 3.00 ERA (2.19) and struck out another eight. Rock on Strasburg. New York Mets (5) at Baltimore Orioles (1). Back-to-back series against the two New York teams can’t be good for Baltimore. R.A. Dickey brings the knuckleball back to confound the Orioles hitters. Washington Nationals (2) at Cleveland Indians (7). Throwback jersey night does not go well for Luis Atilano. I bet that Atilano gets optioned soon (or goes when Chien-Ming Wang comes back up). Florida Marlins (14) at Tampa Bay Rays (9). I hate it when the Rays lose, yet I love it when the Marlins win. I can tell that I’m a huge Marlins fan, because I was ecstatic to see them crushing the Rays. Tampa definitely has a potent offense to catch up, but the Fish proved to be too much. I think it’s great that Florida seems to have Tampa’s number a good portion of the time. I think this could develop into a real rivalry. Hiroshima Carp (6) at Saitama Seibu Lions (2). There’s nothing better than having your team beat one of the best in the Pacific League. Kan Otake notches his first win for the season and the Carp actually see some power without Kurihara. Yakult Swallows (4) at Rakuten Eagles (1). My two least favorite teams are the Swallows and the Lions. Hirohima did its part and beat Saitama, but Rakuten falls on an uncharacteristically bad night for Iwakuma, who gives up two earned runs. Mets (3) at Orioles (1). I’m really starting to get fond of Hisanori Takahashi, even if he was a Giant back in Japan. He hurls seven innings and only gives up one. Nice work. Nationals (1) at Indians (7). Fausto Carmona is having a real resurgence this year. He completely blanks the potent Washington offense while enjoying another seven-run game. Marlins (5) at Rays (6). A real close one that came down to the wire, but Carlos Peña’s offense the past week has been red hot. Tough loss for Florida. Carp (4) at Lions (2). Giancarlo Alvorado does his job over six to earn yet another win. Justin Huber, Kurihara’s DL replacement, even goes yard in Kenta’s honor. The Carp end the weekend at 25-34-2, good enough for fourth by 3.5. Swallows (3) at Eagles (1). Tanaka gives up two in another uncharacteristically bad game to a team whose new manager is paying dividends. Rakuten’s record drops to 29-33-1, good enough for fifth. Nationals (9) at Indians (4). 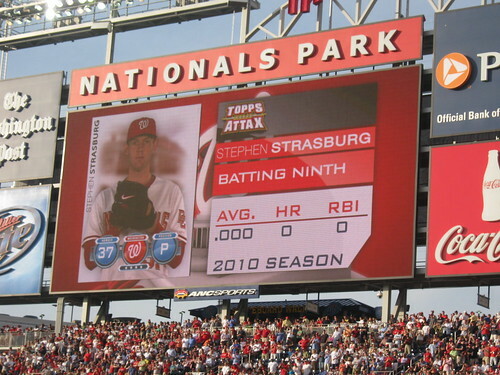 If the Nationals bats awaken every time Strasburg comes out to toss, his record is going to balloon. He tosses 5.1 innings and ends up walking five, but I put part of the blame there on his super-shaky mound. The Nats record improves to 31-33, which is only good enough for last in the competitive NL East. Mets (11) at Orioles (4). The Orioles get brutalized by the Mets, giving up four home runs, two of which went to David Wright. Their record is a miserable 17-46. Marlins (6) at Rays (1). Chris Volstad and the Marlins serve up Jeff Niemann’s first loss of the season and I love it. Mike Stanton still hasn’t hit any home runs, but since he came up last week he’s been hitting a solid 0.368 with an OPS of 0.981. Not too bad. The power is definitely coming. Florida’s record improves to 31-32, barely edging out the Nats for fourth, while the Rays drop into a tie with the Yankees with their 40-23 record. 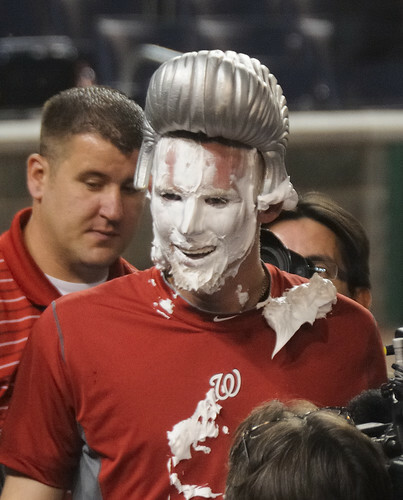 After two shaving cream pies, Strasburg got the silver Elvis wig for his game performance too. I’ll have a more detailed analysis about Strasburg’s start, but 14 strikeouts is not bad at all. Seven of those came in a row from the 5th to 7th innings. An impressive young pitcher. Neither of my teams played. New York Yankees (12) at Baltimore Orioles (7). My friends asked me to go to this game with them, but I couldn’t pass up seeing Strasburg. I’m surprised the Os scored so many, but it wasn’t enough for the Yankee juggernauts. Their record falls to 16-42. Florida Marlins (8) at Philadelphia Phillies (10). Mike Stanton went 3-for-5 and scored two runs, but the Marlins continually gave up lead after lead and lost it with bases loaded in the 9th. A disappointing loss that takes them down to 28-31, tied for fourth with the Nats. Pittsburgh Pirates (2) at Washington Nationals (5). Home runs by Willingham, Dunn, and Zimmerman helped Strasburg put his first curly ‘W’ in the record books. More on this game tonight. Their record, as stated two lines earlier, is now 28-31. Toronto Blue Jays (0) at Tampa Bay Rays (9). Jeff Niemann continues to be perfect as he blanks the Jays and pushes the Rays up to 38-20 on the season. I don't have any pictues of Kenta Maeda to put up, so this is the next best thing. I don’t know why I’m surprised to see Maeda pitched when I see the Carp played a shutout. He really is the best pitcher in the Central League so far. Chiba Lotte Marines (0) at Hiroshima Carp (3). Maeda scatters four hits over 8 while Yokoyama notches the save. This brings Hiroshima’s record up to 20-29-0 in fifth. Rakuten Eagles (3) at Yakult Swallows (3). Both teams battle into a tie in the 12th, unable to break the deadlock. Rakuten’s record kind of rises to 22-28-1, tying them with the Fighters in fifth. Washington Nationals (4) at San Francisco Giants (5). The Nats lose the game in a disastrous 7th inning pitched by Stammen, Burnett, and Walker. Their 24-24 record ties them for fourth with Florida. Oakland Athletics (7) at Baltimore Orioles (5). Mark Hendrickson blows this game in the eighth by giving up three. It’s no wonder the Marlins got rid of him. Baltimore’s record falls to 15-33 on the year in last. Chicago White Sox (1) at Tampa Bay Rays (5). It’s important to establish dominance yet again after the embarrassing sweep the Rays just suffered. Not to mention the fact that Jeff Niemann is the last remaining lossless starter in the American League. He holds on to that title, improving to 5-0 while the Rays increase to 33-15. 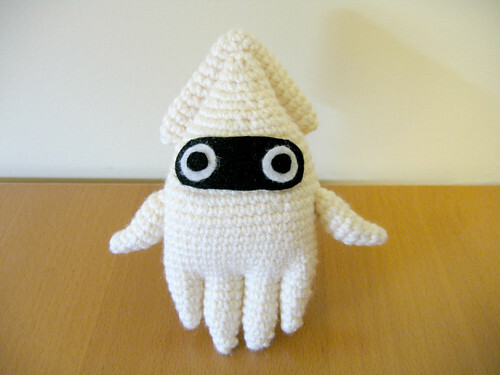 I did a search for "blooper" in Flickr to express my frustration and this unexpectedly came up. Not what I had in mind, but it relieves some of the stress. My PS3 decided to stop reading discs correctly for the second time in its lifespan, temporarily halting my video game NPB season with the Carp just about to widen the gap between third and fourth by beating the Swallows. Hopefully I get the system back before next week, but it’s leaving me at a loss for stuff to play this week. Looks like L4D2 and Sam & Max will be getting my attention. Chunichi Dragons (0) at Hiroshima Carp (9). Nothing like a solid, blowout, shutout win to get the weekend started. Orix Buffaloes (1) at Rakuten Eagles (2). Winning the close ones is key. Rakuten’s weekend rotation is among the strongest in the NPB, so it’s nice to see them get wins. Boston Red Sox (4) at Baltimore Orioles (5). The only thing better than the Sox losing to the Orioles in a game is being there in person to witness it (which I was). Washington Nationals (7) at Florida Marlins (1). What happened Ricky? Kansas City Royals (3) at Tampa Bay Rays (2). Probably the only time all year KC’s bullpen will outduel anyone. There’s a reason Maddon is riding the starters hard in Tampa. Still, it was a strong effort by Jeff Niemann, yet again. Dragons (12) at Carp (6). Chunichi gives back as hard as it took. Buffaloes (1) at Eagles (2). Two nights in a row! Royals (4) at Rays (2). Another late inning loss despite solid pitching by David Price. Red Sox (9) at Orioles (12). Daisuke Matsuzaka’s first start back doesn’t go quite like he hoped, giving up six earned (seven total). Nationals (1) at Marlins (7). This is what I like to see. Way to go Volstad, who throws a complete game gem against the Nats and finally gets his stuff together this season. Buffaloes (2) at Eagles (3). Whoa! Series sweep! This puts the Eagles tied for fourth with their 15-19-0 record! Dragons (3) at Carp (4). Hiroshima takes the rubber game and holds on for the series win. 13-18-0 has them a game behind Yokohama and half a game up on the Swallows. Nationals (3) at Marlins (9). Another solid win for Josh Johnson who was not as sharp as last time, but sharp enough. Both Florida and Washington end their weekend at 13-12, tied for third, 1.5 back from first. Red Sox (2) at Orioles (3). Another sweep for the weekend. These three wins put Baltimore at 7-18. They’re still in last, but now they’re only 9.5 games back. Royals (0) at Rays (1). An old fashioned pitching duel between Greinke and Davis ends with Wade on top. The Rays go into this week still in first with an 18-7 record and a 1.5 game lead. I figured that my Rays gear might put me on the tube. When you go to a sparsely attended game where you’re rooting against the home team, chances are you might appear on TV. Yakult Swallows (2) at Hiroshima Carp (3). A close, 10th inning, walk-off win. 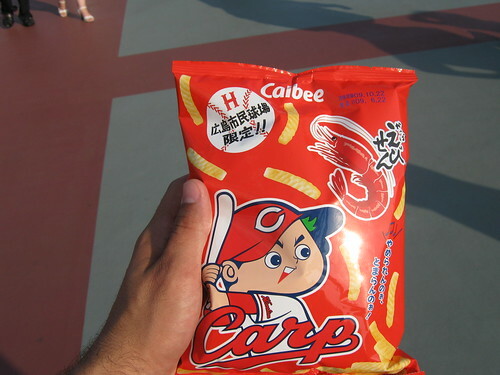 The Carp are proving to be quite the thorn in Yakult’s side. Their record rises to 5-10-0, but they remain in last. Rakuten Eagles (3) at Seibu Lions (5). Not so lucky for the Eagles who fall to Seibu and fall to 7-11-0 two games out of fourth. Tampa Bay Rays (8) at Baltimore Orioles (6). Brian Matusz and Jeff Niemann both pitch strong games into the eighth where their bullpens start giving runs up. 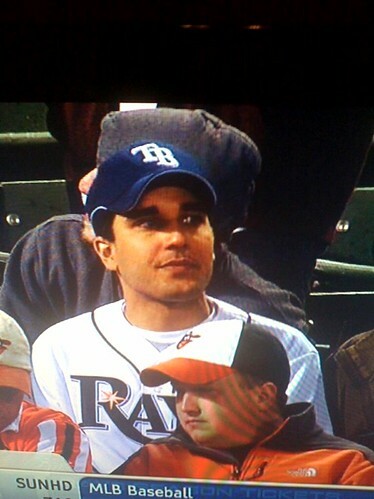 Another extra innings affair that put me on TV and notched yet another ‘W’ in the Rays hat. Tampa Bay rises to 5-3 in third while Baltimore falls to 1-7 in last. Cincinnati Reds (10) at Florida Marlins (8). Florida’s gonna give me a heart attack soon. Their teams continues to have these dramatic come-from-behind attacks that just don’t seem to be holding up. Their game goes 11, but the Fish can’t quite hold on. Florida is 4-4 in second place.